Eunu Song | Posted almost 3 years ago. The English rock band's Facebook, Twitter, and Instagram posts were deleted yesterday while fans received eerie snail mail -- Perhaps hinting at a new album? Don't worry about blaming your sluggish internet loading speed this time -- the new Facebook profile picture is really just a square of white nothingness. Radiohead, the famed English rock band comprised of Thom Yorke, Jonny Greenwood, Colin Greenwood, Phil Selway and Ed O'Brien, suddenly took everything off of their pages on the Internet yesterday afternoon, including their official website (www.radiohead.com), Facebook (www.facebook.com/radiohead), Instagram, and Twitter. According to CNN, this extreme Internet withdrawal has quickly intrigued fans and the music industry -- Apparently British fans also found cryptic leaflets in their mail, reading "Sing a song of sixpence that goes / Burn the Witch / We know where you live." Eerie as these mailing tactics may be, fans are nonetheless ecstatic about these unconventional signs pointing to a possible new album release. Looks like it may be that being followed by your favorite rock band is totally okay -- as long as they have some new tunes to show for. 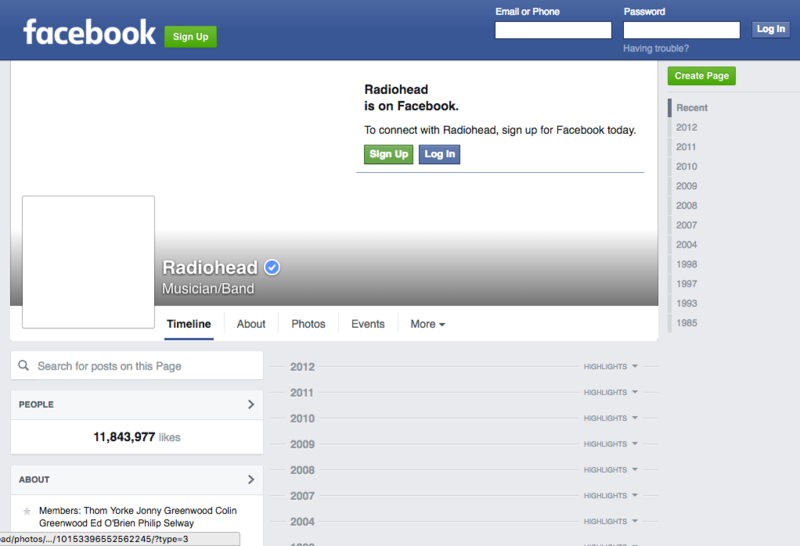 Photo: Radiohead's Facebook page on May 1, 2016.